The leaves of the Elderflower bush are dark green, pointed ovals with serrated edges. The blossom are beautiful, delicate, creamy white stars. Click the image below to enlarge it – you can then print it and take it with you. Once you’ve found your first Elderflower you’ll start seeing them all over the place. You only need approx. 15 blossom heads for a litre of cordial and so you’ll find you don’t need to spend a lot of time picking Elderflower blossom or worry about not finding enough. Once you have tuned yourself into spotting it, then you’ll find an abundance. There is always plenty to go around for everyone. Gently prise of each blossom stem you require from the branch by pinching the stem between finger and thumb and twisting. A pair of secateurs may be preferred. Alternatively, a more considerate approach is to shake the flower heads whilst attached to the tree and collect the blossom in a bag (leaving the ovaries to mature into berries). Don’t collect the flower immediately after rain as the pollen providing the scent will have been washed off. 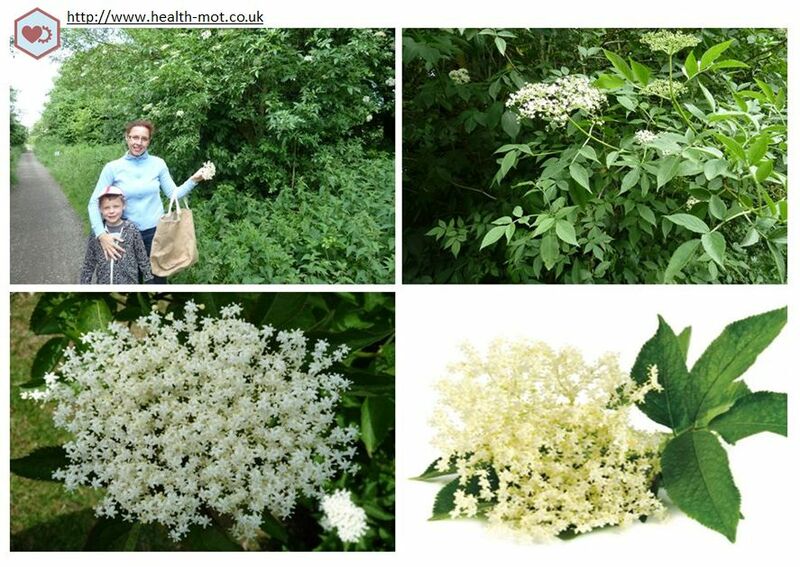 Be wary of picking flowers from trees that look similar to Elderflower. Elderflower is a bush and the sweet scent of the blossom really gives it away. Rowanberry blossom flowers at a similar time, looks very similar to the untrained eye, but the smell is not enticing. Hemlock is poisonous and grows like a weed from the ground, so should be easier to spot and ignore. Finally,make sure you have permission to pick at that location, and don’t pick blossom from the roadside. You can leave it on a piece of newspaper in a warm conservatory, or somewhere outside under cover (it blossoms in June and so could be warm enough to do this in the UK, certainly the summer of 2013). Alternatively place it in the airing cupboard. If you are well-equipped you could use a dehydrator, but the fan-assisted heat may blow off the pollen. Air drying is generally satisfactory and the blossom is dry in a couple of days. Once thoroughly dry you can put it in jars and use it later in the year for making cups of tea. There are many reported benefits, but a natural remedy for helping to induce sweating at night to stave off a cold is one of our reasons for drinking it. This is so easy to make I wonder why we even bothered buying readymade cordials from the shop in the past. Since transforming our health around we rarely consume refined sugar and so we have adapted the traditional recipes commonly found on the Internet by reducing the quantity of sugar by a half and using less nutrient-sparse sugar such as unrefined muscovado. It gives a darker colour to the cordial, yet the elderflower blossom scent still remains strong. I rarely drink cordial myself but it’s nice to know that when Johnny wants cordial (and he is quite fond of plain water) we can give him something that he helped to make, and that contains no artificial chemicals and excessive amounts of refined sugars. See this link for how we make the cordial. It really is a few minutes of a job. 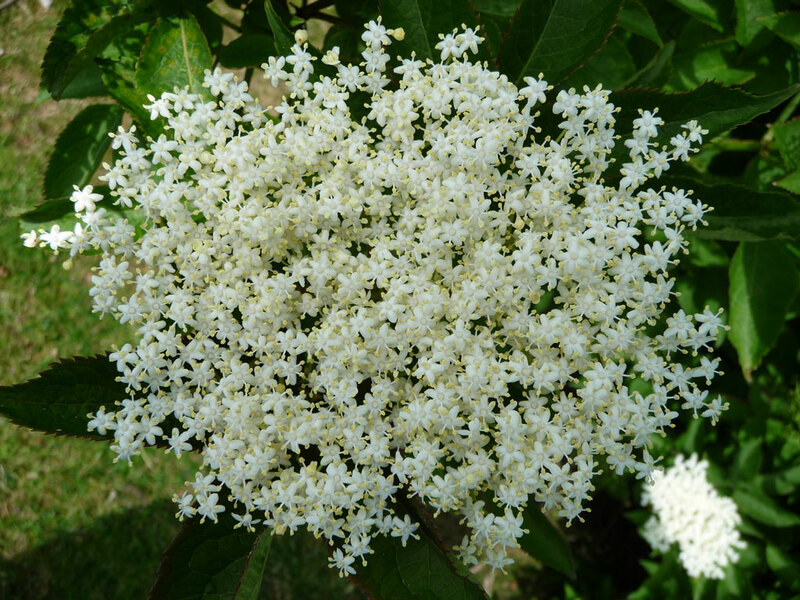 There are a number of different drinks and foods you can experiment with using the powerful scent of the elderflower blossom. If you are making Elderflower champagne be careful to keep the bottles in a cool place and check the pressure frequently. We had a glass bottle explode in the kitchen cupboard and it was a right sticky mess. Gooseberries are ripening at a similar time to Elderflower and so Gooseberry and Elderflower jam is a nice treat to make. You might also make Elderflower vodka, Elderflower tea, or even pannacotta. Although my wife was familiar with Elderflower blossom foraging and cordial making in the Czech Republic she wasn’t familiar with collecting it in the UK. It’s not rocket science to find and harvest blossom, but we are great believers in having an experienced guide or mentor to help us if we are new to something, or unfamiliar with the best way to go about it under new circumstances. So, we found online a wonderful chap by the name of Jesper who organises various foraging excursions throughout the year for wild food (You can find him at Jesper Launder). Whilst out collecting elderflower my wife was introduced to wild garlic, and they also found a mushroom typical of the sort she would commonly find in the Czech Republic. At the end of the trip all participants got to taste fried, battered wild mushrooms and to take home a bottle of elderflower champagne (which was thoroughly enjoyed a week later).